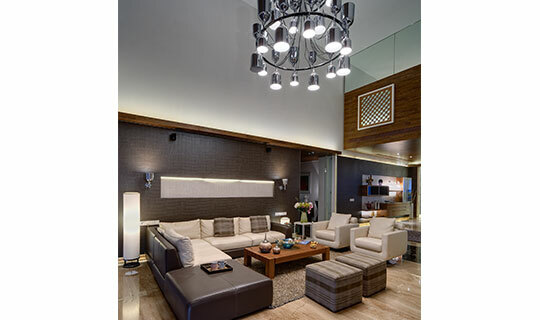 Carpet Area : 4000 ft. 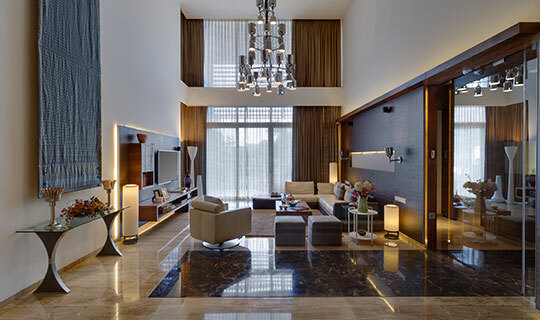 Designed as a show apartment in a luxury residential complex, the Aria Penthouse is an indulgent four-bedroom flat, exuding sophistication in its finishes, while allowing flexibility for usage. 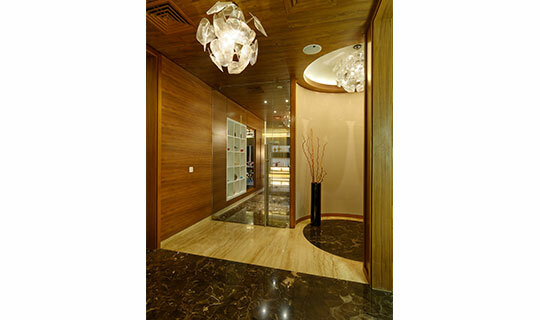 A clear circulation pattern divides the floorplan into living, private and service zones. 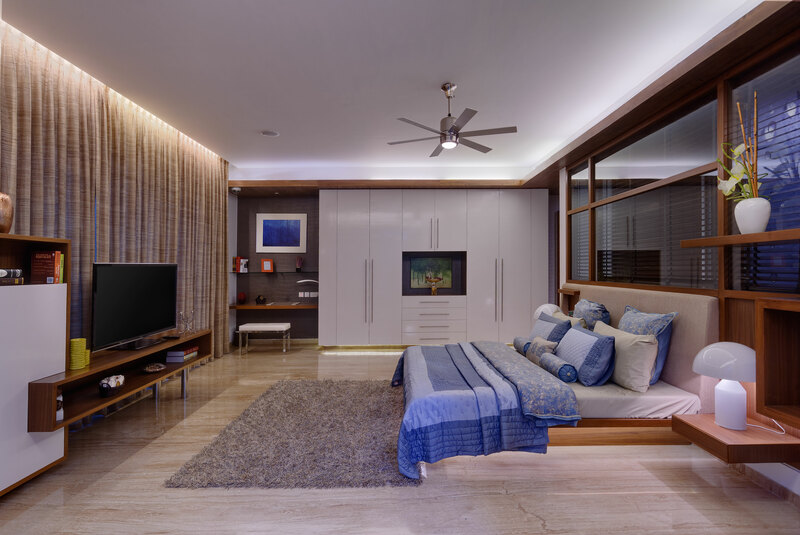 The interiors have been minimally partitioned for flexible space utilization, allowing a free flow of space throughout the house, while giving the impression of a larger overall volume. 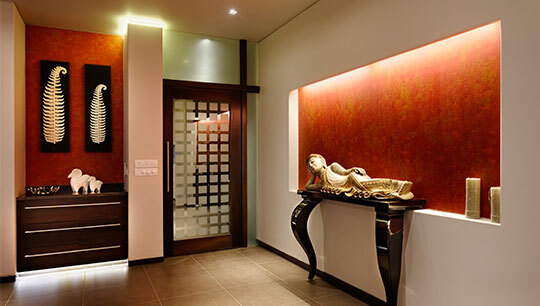 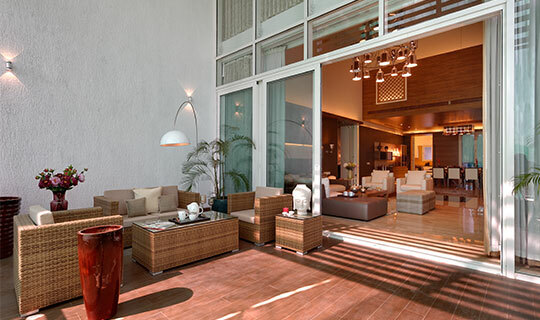 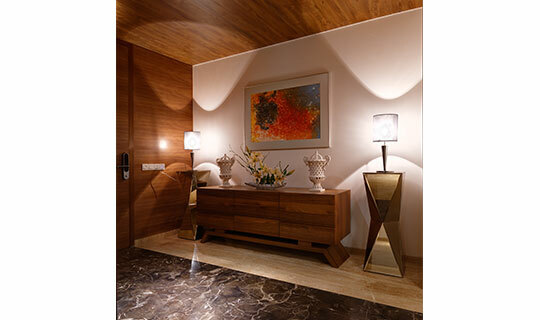 Ambient lighting accentuates the warmth of walnut finish wood to impart a cozy, welcoming feel to the entrance lobby. 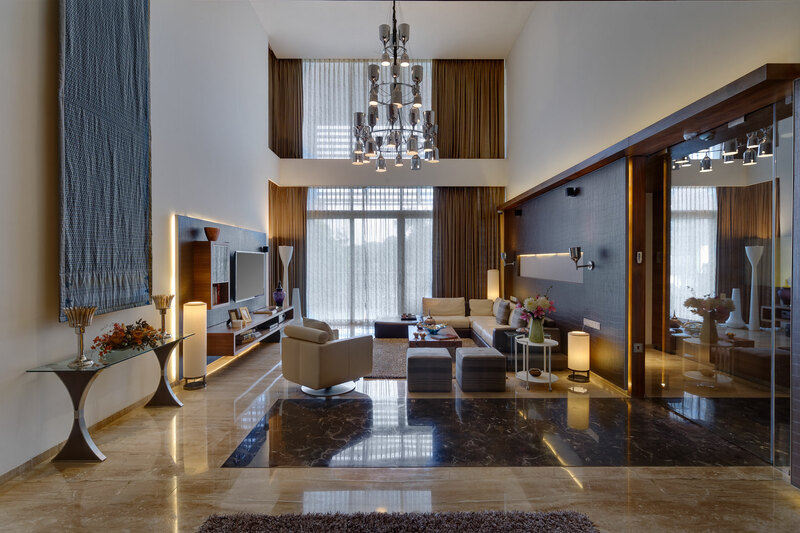 Custom designed furniture and artwork set against a contrast of material textures, sneak a peak into the elegance and sophistication of the living spaces beyond. 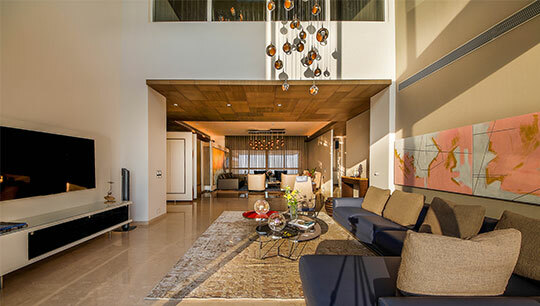 The design cashes in on the double height volume in the living area, using full height glazing and sheer curtains to brighten the entire home with diffused daylight. 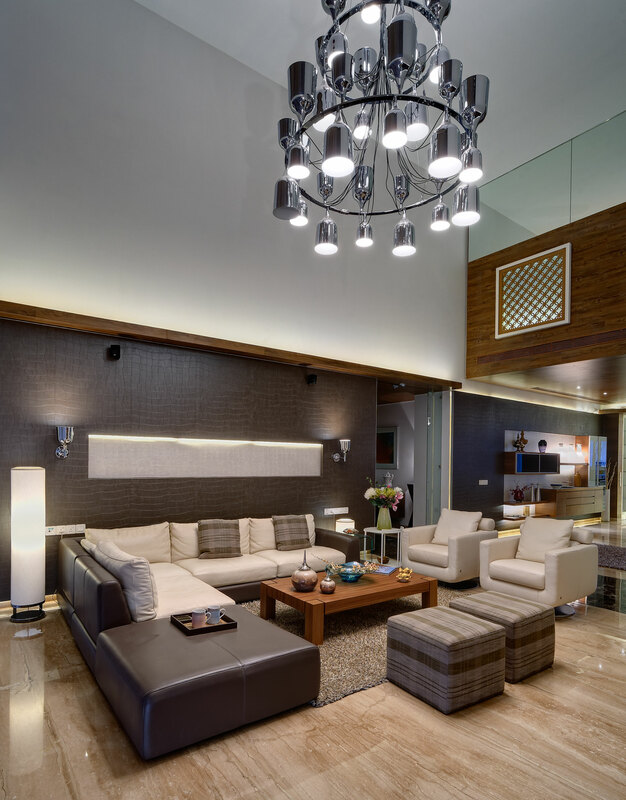 Beige marble contrasts with wooden accents and a contemporary steel chandelier, lending an eclectic vibe to the breezy double height living room. 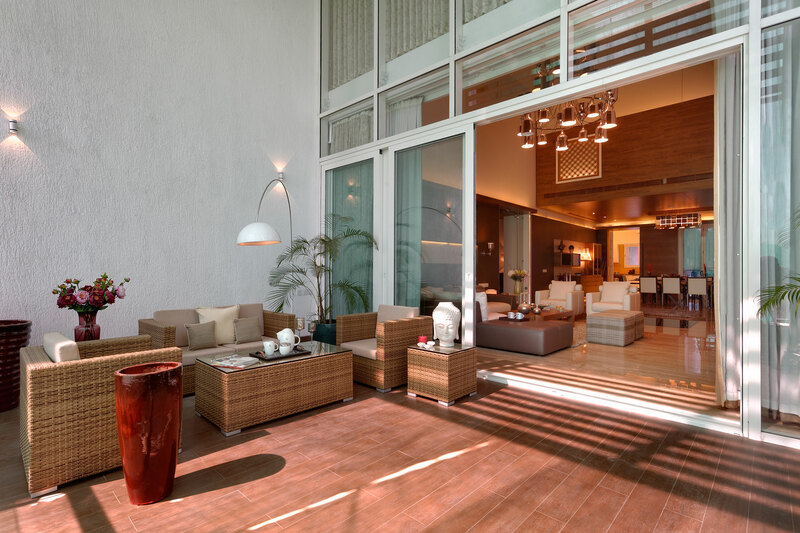 An outdoor terrace acts as an extended family room, equipped with a plunge pool and arresting views of the greenery in the distance. 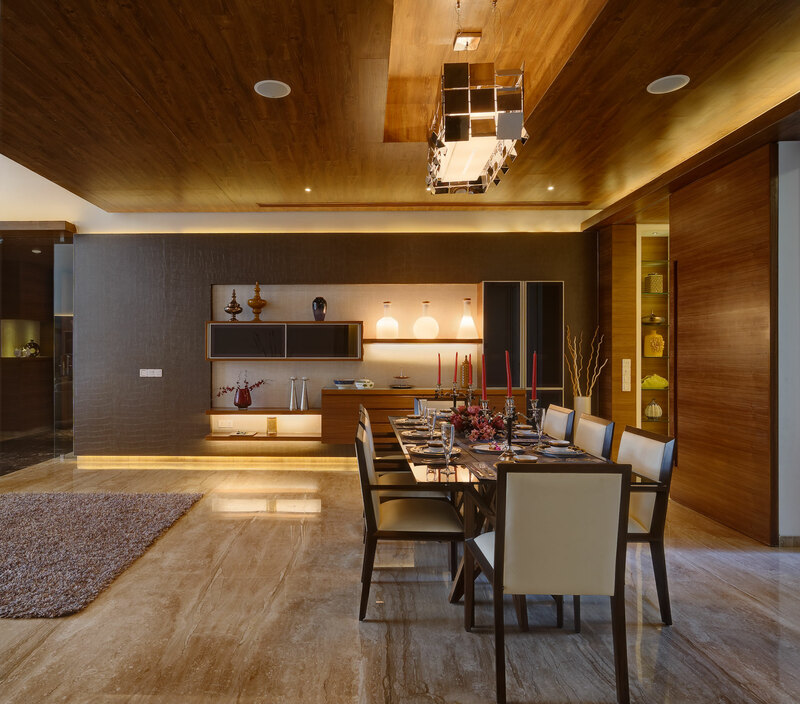 A play of volumes ensues as the living space merges with a cozy, low-height dining niche rendered in leather and wood. 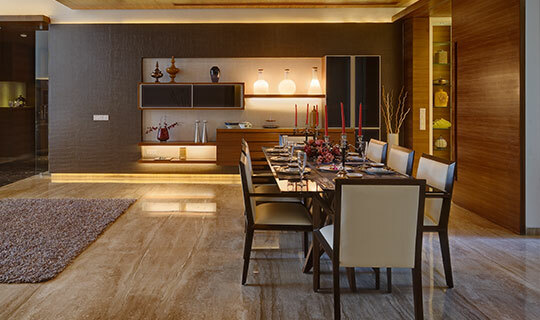 Ambient lighting and warm material tones establish a snug mealtime setting, while an extended open air balcony allows the outside environment to penetrate the interior space. 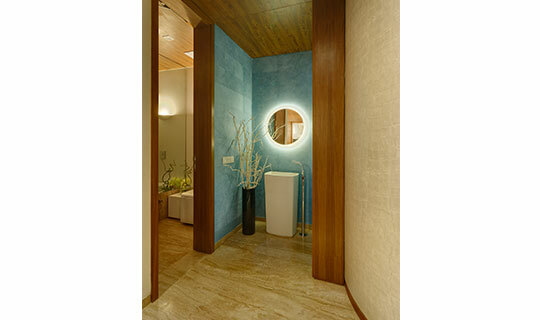 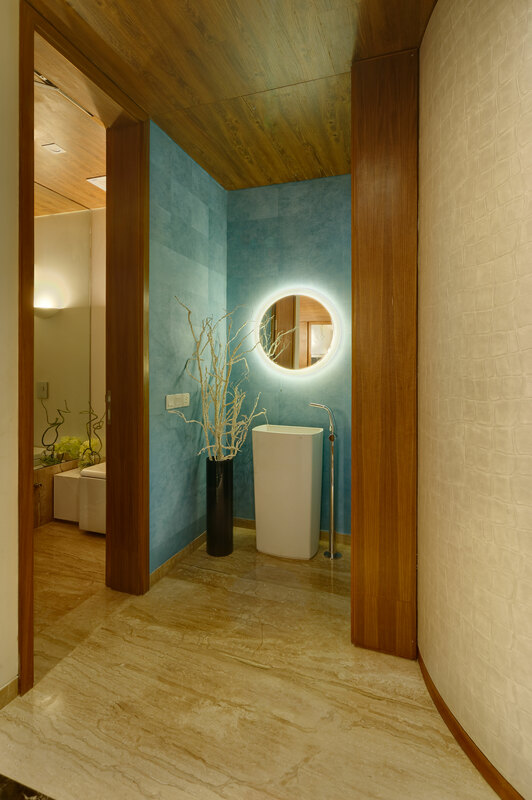 A backlit vanity, minimal décor and an industrial steel faucet set against a refreshing teal background make up the chic powder room, apt for a moment of quiet rejuvenation. 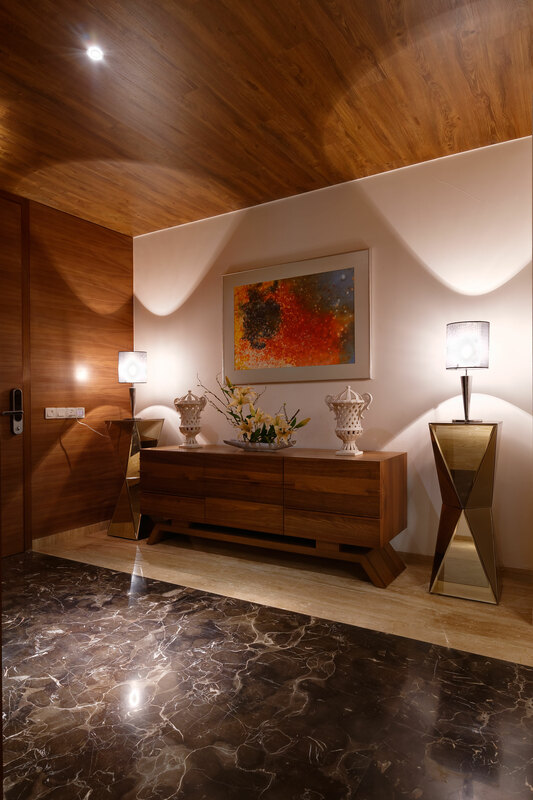 In the private rooms, beige marble flooring and wooden ceiling elements contrast with white walls, allowing a perfect setting for the introduction of colours through furniture, furnishings and artwork. 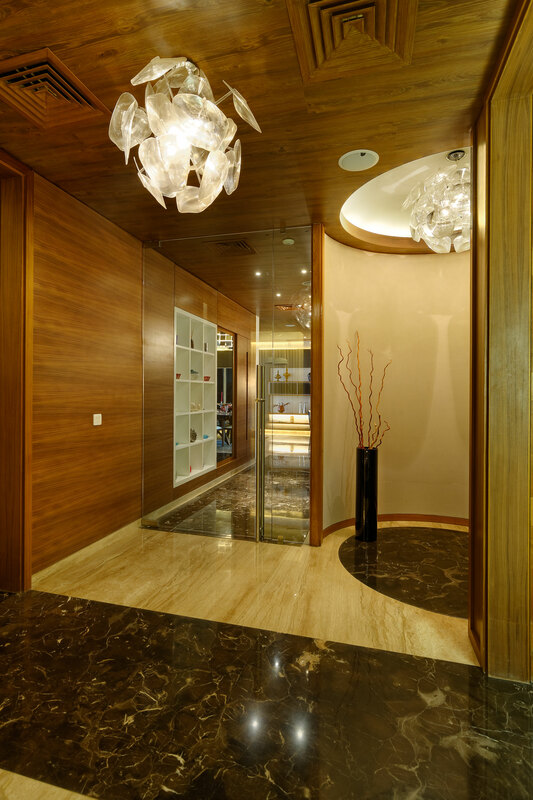 Strip lighting and customized wood paneling, work toward highlighting linear elements and clean cuts; creating a visual rhythm within the living space, while allowing spatial continuity across various residential zones. 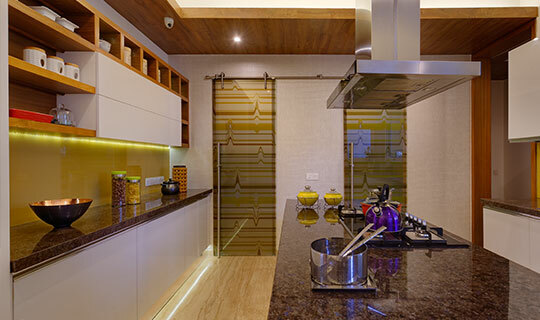 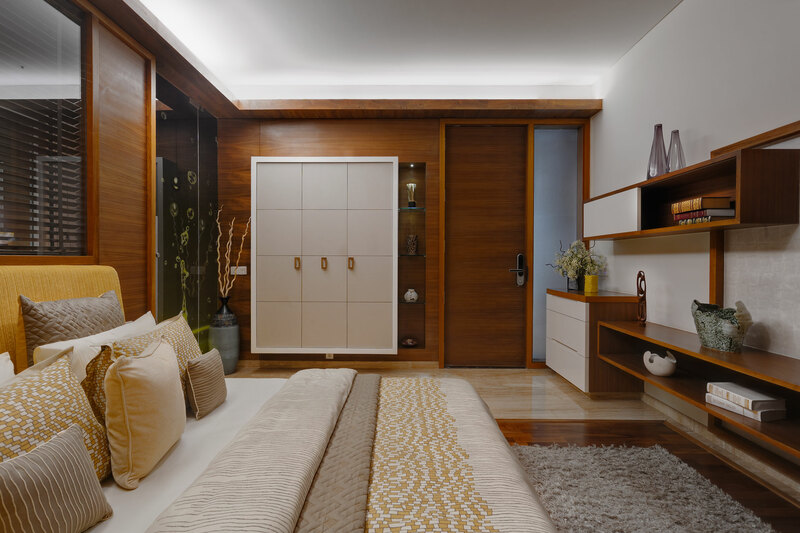 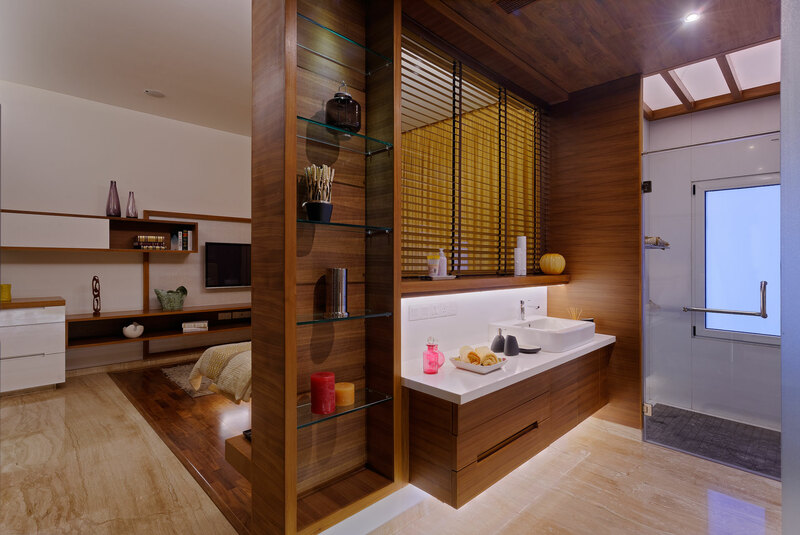 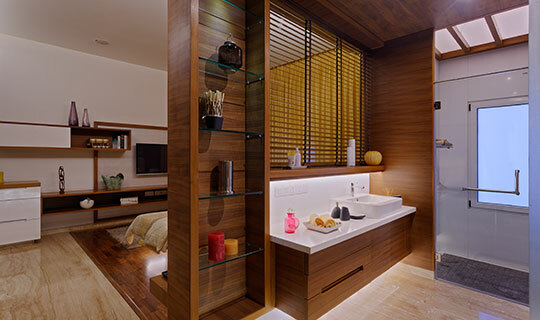 Customized wall units and furniture provide a holistic design aesthetic, while meeting individual functional requirements and adding a personal touch to each room. 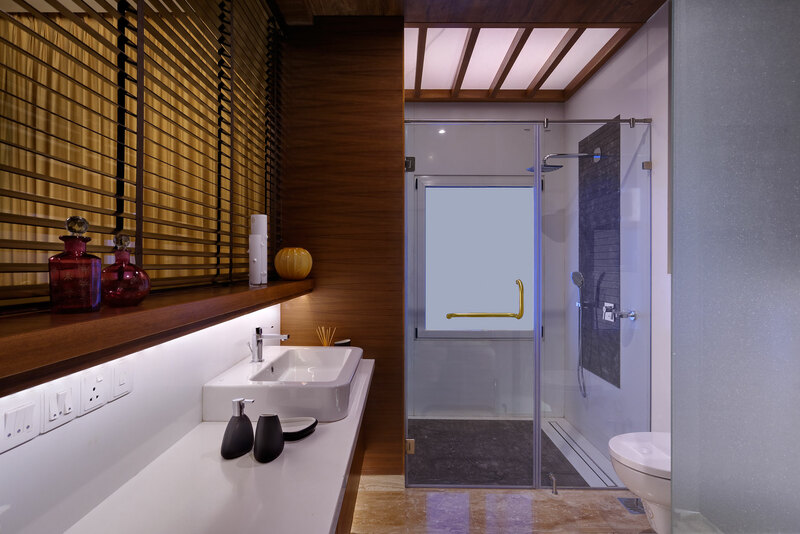 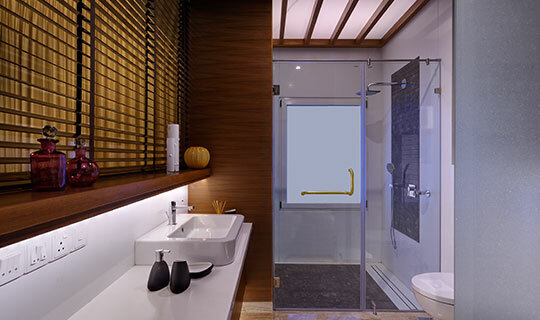 Individual bathrooms are laid out as extended bedroom space, establishing visual and physical continuity across the private ‘suite’. 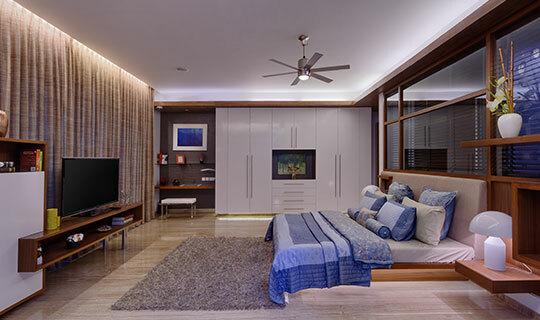 The free-flowing layout enhances the spatial quality of the bedrooms; while vanishing blinds allow flexible modulation of visual privacy.A spacious kitchen with an island counter satisfies all contemporary culinary requirements, housing handy organizational elements, storage and workspace, within its plush setting. 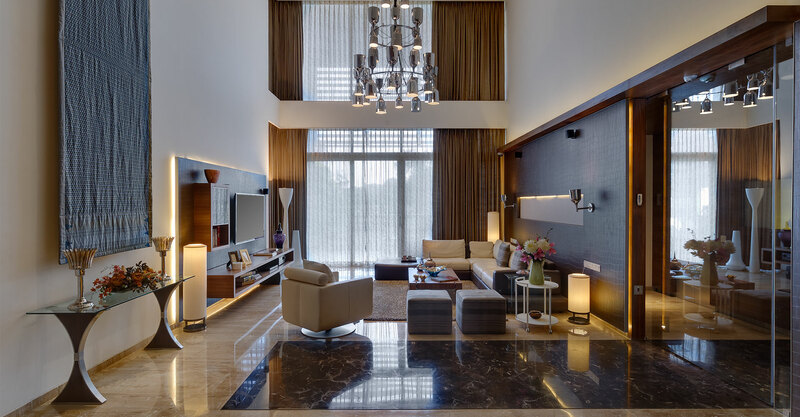 The minimalistic, yet classy interiors subtly accentuate the existing architecture of the penthouse, resonating with the developer’s vision of establishing luxury living space. 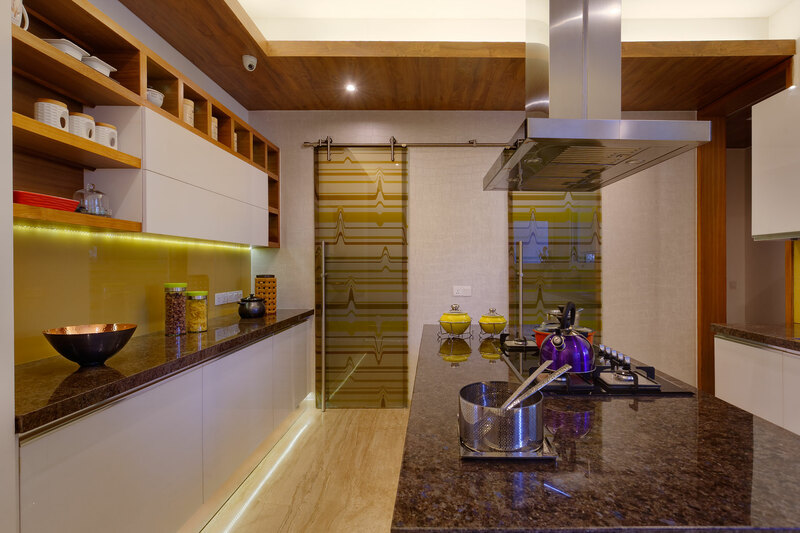 In its functional simplicity and visual sophistication, the apartment proves an irresistible prospect for the developer’s potential clients.